It is important that we label the containers that we use to hold our homemade soaps, detergents, and cleaners. This way all family members and visitors know what is in the bottles. If somebody mistakes your homemade shower cleaner for mouthwash they will be very unhappy! You will be unhappy if your visiting mother, thinking she has found a spray bottle of water, mists your prized roses with an unlabeled bottle of homemade weed killer! You get the picture. Someone could also accidentally create a poisonous mixture by mixing unknown chemicals together. So label those bottles! The easiest method is to just hand-write the name right on the container itself with a marker. I don’t prefer this method because if you mess up or want to change it later, you have to remove the writing. It is possible to remove the writing with acetone. Always wear gloves when working with solvents. Sharpie has a new Sharpie Extreme marker that is fade resistant to sun and water. It currently comes in four colors: red, green, blue, and black. The next method is to use peel and stick labels. You can either hand write on them with a permanent pen or you can print them out on the printer. It is a little more work to print them out on the printer but the end result looks nicer. I have tried using the regular address and shipping labels, but since they are made of paper, they just don’t hold up on homemade-cleaner bottles. So what we need is a more durable label that can hold up better to moisture. One thing I noticed is that most weatherproof labels are for laser printers only. I guess this is because the label is designed to resist liquids and therefore the liquid ink droplets from an inkjet printer can’t absorb into the label material. There are a few durable labels that can be printed on an inkjet printer. The best one I can currently find is the Avery 22827. If you have a laser printer, the Avery 15513 is a very good choice. If you prefer to hand write your labels, then you have options for that as well. The Avery 5440 is a great choice. These labels are actually dishwasher safe! Imagine that. If you want to see more labels that Avery has to offer, go to their Blank Labels page. If you are technically inclined, a handheld label printer can be a convenient solution. The Epson LabelWorks LW-400 is a top choice. Epson makes many types of label media for this device. 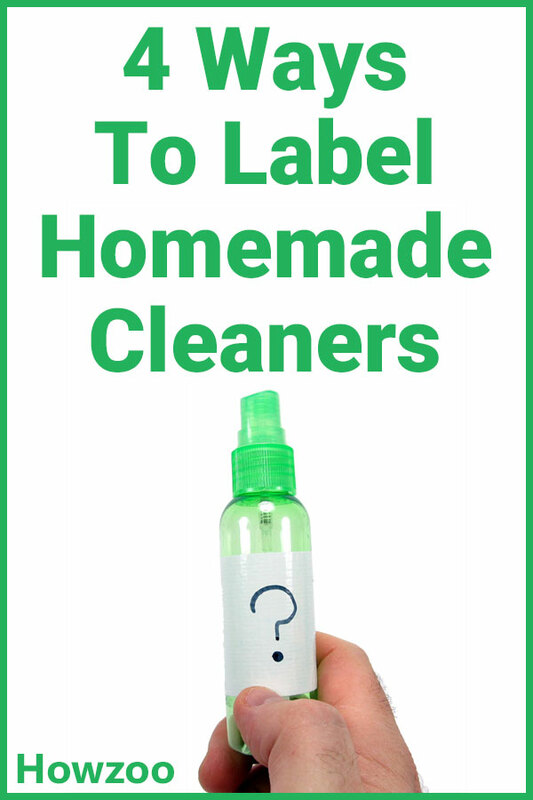 To label our homemade household cleaners, we will want a durable material that is moisture resistant. The Epson LK-4WBW labels are designed for outdoor use so they would be a great choice for use on homemade cleaner bottles. This method is currently my favorite method. What you do is use white duct tape to make your labels. And yes, Jeff Foxworthy said I might be a redneck if I use white duct tape to label my bottles……but it does work. The duct tape is more water-resistant than the standard paper labels. I can cut them to the exact length that I want. Duct tape labels are also much cheaper than the weather-resistant labels. I calculated that the 2″x 4″ weather-resistant labels are about 8 times as expensive per foot as the duct tape. Plus I can repair the living-room furniture with the duct tape. Ok, I was just kidding on that last part. You could write on the duct tape with a Sharpie Extreme that is mentioned at the top of this article. Do you like quick and easy or detailed and pretty? The labeling method you choose is totally up to you. Any of the methods mentioned in this article will serve the purpose of identification and that is the most important thing. Please feel free to comment with your labeling ideas and tips. 1- Apply your home made label (Sharpie on paper or on pale masking tape). 2- Waterproof by applying a larger piece of transparent packing tape over it.